The public is reacting skeptically to last month’s multilateral agreement aimed at freezing parts of Iran’s nuclear program. Overall, more disapprove than approve of the deal, and there continues to be broad skepticism about whether Iranian leaders are serious about addressing international concerns over the country’s nuclear program. The latest national survey by the Pew Research Center and USA TODAY, conducted Dec. 3-8 among 2,001 adults, finds that 43% disapprove of the agreement between the U.S. and Iran over its nuclear program, 32% approve of the deal, while 25% do not offer an opinion. The public’s doubts about the intentions of Iran’s leaders are as high as they were last month before the nuclear agreement. By roughly two-to-one (62% to 29%), those who have heard at least a little about the agreement say Iran’s leaders are not serious about addressing concerns over the country’s nuclear program. There are substantial partisan differences in opinions about the nuclear agreement. Nearly six-in-ten Republicans (58%) disapprove of the accord, while just 14% approve. By contrast, Democrats approve of the agreement by about two-to-one (50% approve, 27% disapprove). Among independents, more disapprove (47%) than approve (29%). The ideological wings of the parties hold sharply divergent views of the deal. Conservative Republicans disapprove of the agreement by a 64%-13% margin, while liberal Democrats approve of it by 60%-19%. Among Republican and Republican leaners who agree with the Tea Party movement, nearly three-quarters (72%) disapprove of the agreement while only 13% approve of it. Across most demographic groups, more disapprove than approve of the Iran nuclear agreement. However, looking at education, 48% of those with post-graduate degrees approve of the deal while 37% disapprove. College graduates are divided (41% approve, 38% disapprove), while those with less education on balance disapprove of the agreement. The survey finds modest public awareness of the nuclear agreement, which was reached Nov. 23 in Geneva. About a quarter (24%) say they have heard a lot about the agreement, 48% say they have heard a little while 28% say they have heard nothing at all about it. The balance of opinion on the nuclear agreement is not much different among those who have heard a lot about it (44% approve, 51% disapprove) and those who have heard a little (36% approve, 45% disapprove). Among those who have heard nothing at all about the nuclear deal, 52% do not offer an opinion. The nuclear accord has done nothing to reduce skepticism that Iranian leaders are serious about addressing international concerns over the country’s nuclear program. 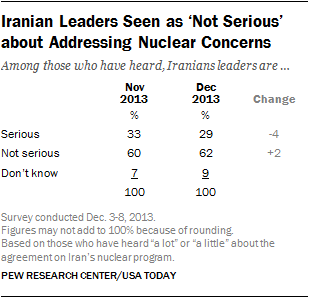 Among those who have heard at least a little about the agreement, 62% say that Iranian leaders are not serious about addressing international concerns about their country’s nuclear enrichment program compared with just 29% who think they are serious. Opinion on this question has shown almost no change since early November, when 60% of those who had heard about the ongoing nuclear talks said they did not think Iranian leaders were serious about addressing international concerns over their nuclear program; a third (33%) thought they were. Even among Democrats, who approve of the nuclear agreement on balance, there is skepticism about Iranian leaders. Overall, 49% of Democrats who have heard of the agreement say they do not think Iran’s leaders are serious about addressing international concerns; 41% say they are. The balance of opinion is much more lopsided among independents (63% not serious, 29% serious) and Republicans (77% not serious, 14% serious) who have heard at least a little about the accord. Not surprisingly, support for the nuclear deal is much higher among the share of the public that has heard about the agreement and thinks Iranian leaders are serious (65% approve, 22% disapprove). Among those who do not think Iranian leaders are serious about addressing concerns over their nuclear program, 63% disapprove of the nuclear agreement between the U.S. and Iran, 26% approve.